Halloween is just next week! Are you ready yet? Do you celebrate it or not? It’s not terribly popular here, but we do decorate the house for a little fun. However, the children don’t go out trick-or-treating, and I’m okay with that. 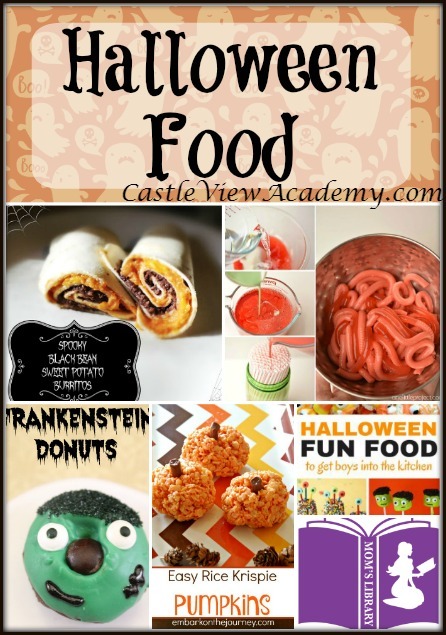 We can make some fun Halloween food to eat at home and have our own little party. If you missed last week’s round-up, I featured 18 Pumpkin Activities. Have a look through and be inspired! This resource for Moms is packed full of parenting tips, activities for children, crafts, recipes and more! One thing I love about Halloween is how creative one can get with food, both treats and healthy food as well. 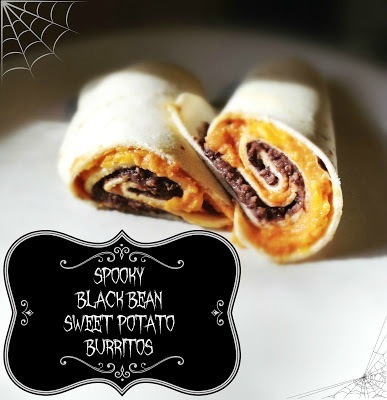 Midwest Modern Momma has been able to make black beans not-so-scary with these spooky black bean sweet potato burritos. Midwest Modern Momma also has these cute little Frankenstein Donunts for dessert. 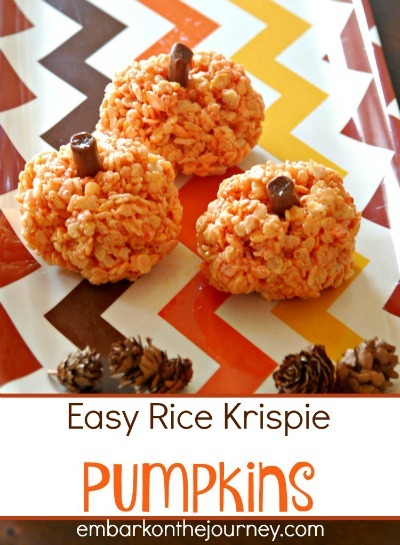 Embark on the Journey has turned one of my favourite treats into Easy Rice Krispie Pumpkins. 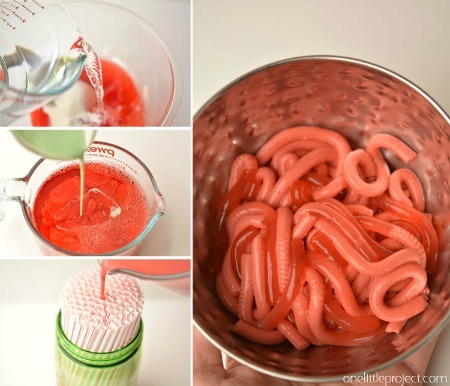 One Little Project shows us how to make jello worms. How grossly delicious! 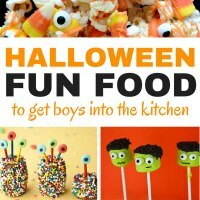 Brain Power Boy has a collection Halloween Fun Food – just perfect for getting boys into the kitchen! I absolutely love the way you made the worms. Using a straw makes them have ridges like their bodies do…yuck! I am sure these would be the hit of the Halloween party. 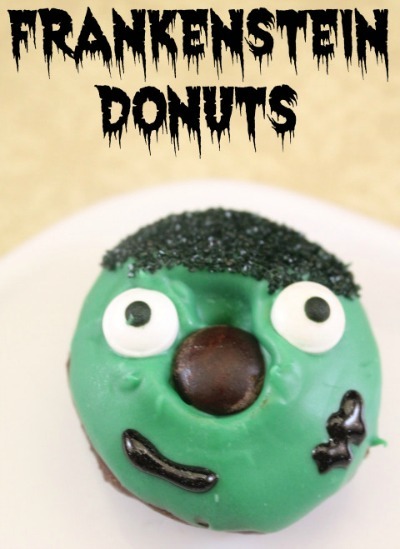 And the Frankenstein donuts are so cute I couldn’t eat them; well maybe…. I’m a bit queezy about the worms, but the kids were fascinated to see them. Donuts aren’t very popular here, but I’ve had them on my mind lately….I just might have to search one out ‘for artistic purposes’ of course! eww, I know – yet fascinating! And much better than the sugar coated store-bought candy. That sounds like lots of fun! Enjoy! It’s funny how rolling food can make it much more appealing, sometimes (a good way to present items children don’t usually like). Have a great day! It’s great to see you back again this week, Sheila! We’ve had a very good week, and I wish you a great one, too!